The first step towards email marketing success is to achieve a healthy email open rate. The average open rate in Great Britain is 24 percent. This is slightly lower than the average across Europe, which stands at 29 percent. As well as varying between countries, average open rates also vary between industries. Despite these variations, one fact remains universal: the higher your open rate, the greater your opportunity to drive conversions. You can tailor your email subject line to resonate with each segment. This increases the likelihood of your emails being opened. Testing your send times can help boost your email open rates. Different audiences are more responsive at different times. If you want to get really clever, try using our Intelligent Timed Send feature. This personalises send times for each individual recipient — a smart way to increase open rates. Try personalising your subject lines to catch your recipient’s attention and tempt them to open. You could use their first name, products they previously browsed, or location data as a way to personalise. Creating a sense of urgency in your subject line is a smart way to compel recipients to open now before they miss out. For example, use the subject line to highlight that the discount code inside the email will expire in 24 hours. Subject lines are important but they aren’t the only way to grab your recipient’s attention. Try changing the preview text in your emails to give you maximum inbox impact. Use your preview text to build upon the message containing in your subject line and persuade your recipient to open. Your subject line and preview text are opportunities to make your recipient feel special. Don’t address your customers en masse. Instead, write as though you are addressing one person. Each customer should feel like they are being offered something exclusive. Just for them. Rather than emailing people out of the blue, try sending behavioural triggered emails. This is an effective way to increase open rates. When your email is sent in response to an action someone has just taken online, your message will be both timely and contextually relevant. This means people are much more likely to open it. Emails could be triggered for any number of reasons. Cart abandonment emails are triggered when a person leaves a website with items still in their cart. Almost 50% of all cart abandonment emails are opened. As we’ve already explored, subject lines are a key tool in your arsenal to increase open rates. Testing subject line length is important. Some audiences may respond better if you keep it short and sweet. Others may like a wordier approach. Test and learn what subject line length works best for your audience. While it is important that your emails clearly come from your brand, you might get a better response if you include a person’s name in the sender field. Receiving an email from a specific person at a brand feels more personal. This personal touch may help to increase your email open rates. Avoiding spam filters is crucial if you want to increase your email open rates. Choosing a reliable email service provider is key. As is having a recognisable sender name. Optimising your emails for different mail clients and devices is another important way to increase your open rates. If your emails don’t look good in the inbox, people may be put off opening them. Test your subject line length for mobile. This may be different to desktop. Be sure to also check how your email appears when received by different mail clients. Nurture campaigns are email campaigns which help you to strengthen the relationship with each customer. Including nurture campaigns in your email strategy can have a positive effect on your email open rates. If customers feel connected to your brand, they are more likely to open your emails. To keep your open rates healthy, remember to maintain the hygiene of your email list. Cleaning your list involves removing any incorrect email addresses that keep bouncing back. Customers that have not engaged for some time should also be removed from your list. This will leave you with a slightly smaller but more engaged list, and higher open rates. Our fourteenth and final tip for increasing open rates is never stop testing. Adopting a test and learn approach is key if you want to maximise open rates and other email marketing metrics. Test, measure, analyse, refine, and improve. This should become your email marketing mantra. We hope our fourteen ways to increase open rates have equipped you with some new strategies — and reinforced those already in place. Whatever your open rate is today, chances are there is room for improvement. 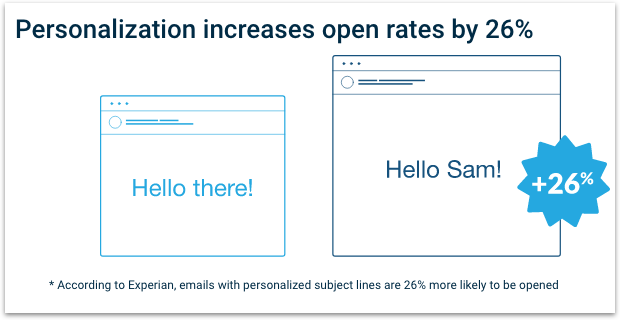 Increasing your email open rate, opens to door to more conversions. Drive conversions in greater numbers and increased revenue is the natural by-product. Once you’re happy that you are doing your due diligence when it comes to boosting open rates, consider what you can do to improve your email click-through rate. To build a foundation for email marketing success, it is important that you have the right email marketing platform in place.